One thing about Syria - Coca Cola hasn't penetrated this market. In fact, we don't see any American products here, people don't want them due to America's support of Israel. We watch elementary school children, no older than 10 years, demonstrate during recess against Israel and the US. Parents joke and call these children the 'little' Intifada. We've seen this all over the Middle East and were worried that a generation of goodwill is lost to America. Not done with ruins, we hook up with a friendly English Arabic student, Henry Gates, who helps us get around and advises us to pose as Canadians. 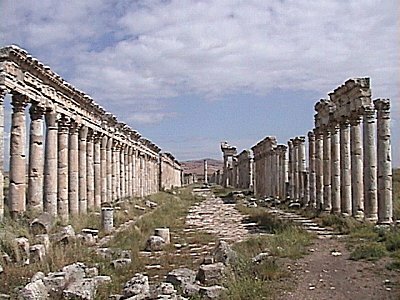 We visit the ancient city of Apamea. 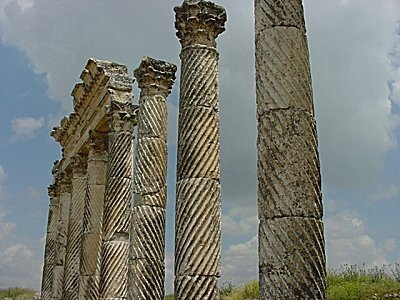 Apamea is another decapolis city - one of the ten cities that comprised a commercial league during the Roman times. The only trading today occurs between tourists and postcard vendors. We enjoyed an interesting political discussion with a young student who believed America was incorrigably corrupt. No, he didn't hold anything against American people, he said, only the American government. Then he added, the American people vote for a bad government. He relished criticizing American politics but like most Syrians, he didn't criticize his own government except by careful inference. 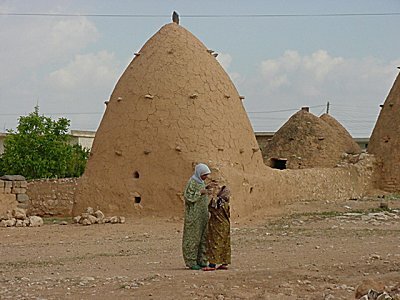 Instead of dead cities, the living villages can be more interesting. 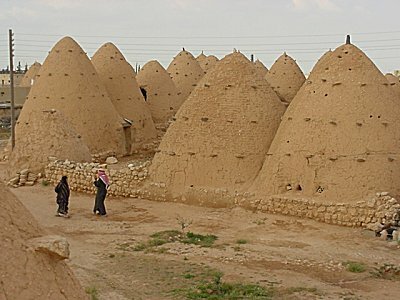 These 'beehive' huts keep out the desert heat.